Todays ride started at the Iona hall. About 20 in the group and the ride was to Wood Islands, about 21 km. A few of us did the return ride to Iona. The start today was in Milton and riding to Summerside, a 60+ km. I was only with them for 20 km. A interesting fact, 40 women to 4 men. Today I cycled from Brackley to Mount Stewart and return. This peat bog is in Bedford near marker 191. A rest area near the bog, I was my old rain bike as it had rain about 50 mm in the last 36 hours. A view of #9 from the tee off, it is the only one with dogleg. I expect it is my last day for the season as the course is closing next weekend. 14 cyclists in the ride this evening, next month the ride will be in the afternoon. This evening I cycled to Belvedere Ave, Then the trail to Winsloe. At the Junction The left goes to Hunter River, take the right to go to York. 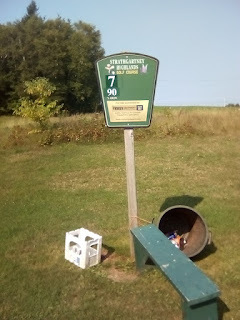 A complete map of the trail is located here. Today I cycled the trail from Charlottetown to Milton and back to Lower Malpeque road. Photo is Coles creek looking north. Today I was touring western PEI, stopped in Skinner's pond. Today I cycled Milton to Hunter River and back to Milton. logged 33 km. Lots of berries on the Mountain Ash this year. Some of the trees are starting to show fall colours. There was 11 in the cycling group, it was getting dark by the time we got back to the Sherwood road. Today I cycled from Hunter River to Breadalbane and return to Hunter River. I was cycled this evening for a hour or so. Photo is the North River as seen from the bridge looking south. The paved cycling / walking along the divided highway as seen from the bridge. I was to the wood lot today and mowed the weeds in the clearing for the last time this year. This evening the group cycled from York to Tracadie, we stopped for a bit of a rest here. A nice evening, sunny at 25 and feels like 30. After lunch I cycled from Milton to Hunter River and back to Milton. Sunny at 25 with a light breeze. Several other cyclists on the trail as well. This morning I cycled from Hunter River to Breadalbane and back. The parking lot at Hunter River, no one around yet today. Not sure what the yellow flower/weed is, but I will need to make one more cut with the mower. I spent a couple hours today removing bark, some logs not ready to let go yet. I was to the town office this morning, the staff are doing a good job on keeping the flowers looking nice. After lunch I cycled the trail from Milton to Hunter River and return. I saw over a dozen other cyclists. I the mowed the lawn. 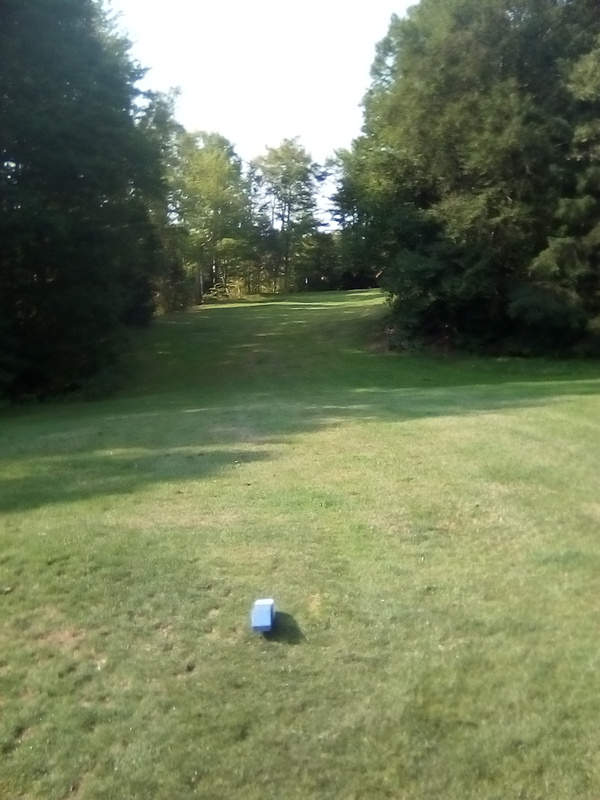 Golfing yesterday but game not improving, I lost two balls. Today I cycled from Breadalbane to Kensington and return. This field of Canola is near Freetown. In Breadalbane there is a hiking trail off the Confederation Trail. It was sunny at 20 with a 30-35 km/h breeze. I cycled around Charlottetown, I saw these horses getting ready for the days rides. I then cycled the trail to Winsloe. I was to the wood lot after lunch. We had a couple showers during the afternoon.